There are some new businesses in the area that I wanted to highlight. If you’ve had the chance to visit any of them, let me know! I’d love to hear about your experience. Old Tavern Farm Winery- Located on a horse farm in Saratoga, they finish and bottle all of their wine on site. Currently they offer a Rosé, Cabernet Sauvignon and Chardonnay. Nighthawks- A farm-to-table restaurant in Troy. Their menu changes on a regular basis and everything looks fantastic. Caskade Kitchen and Bar- in Cohoes. Caskade offers shared plates like Green Papaya Salad, Street Corn Dip and Pork Belly Katsu. Plus, how pretty is this cocktail? I can’t wait to get over there and try it! Bard and Baker- A board game café offering over 400 games to choose from. Located in downtown Troy. Hank Hudson Brewing at Fairways of Halfmoon. Inspired by British pub culture, the brewery is located in a new space reflecting rustic and industrial design with a view of the golf course. Currently they have 10 beers on tap. Dove + Deer- Located in the heart of Albany’s Center Square. Solevo Saratoga- Traditional Italian restaurant right in downtown Saratoga. Unified Beerwoks- Located in Malta near Global Foundries, they offer a nice selection of craft beers including IPAs, Stouts, Sours and more. I really liked the Saison. 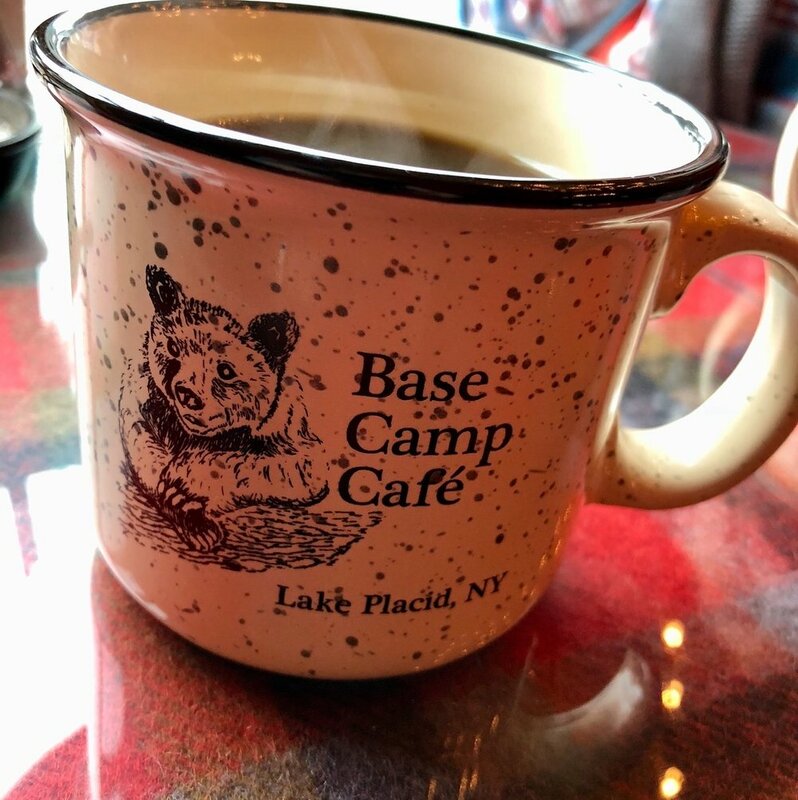 If you’re in the Lake Placid area and looking for a great spot to grab a meal or a drink, I have compiled a list of places to check out. If there is an establishment that you love and I failed to mention, please let me know! I always enjoy the Adirondack Wine and Food Festival held every June at the Charles R. Wood park in beautiful Lake George, NY. 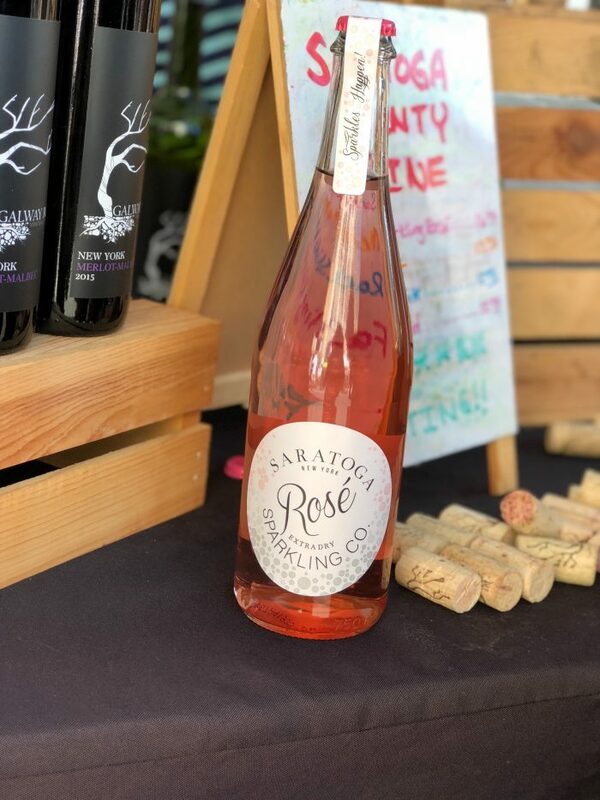 There are over 80 wineries, distilleries, breweries and food vendors giving attendees the opportunity to uncover new local favorites or stock up on products they know and love. Although the weather wasn't ideal for the event, the crowds didn't indicate that. You can't rain on our parade! Since the Adirondack Winery sponsors the event, I wanted to head there first for a tasting. After sampling a few different varietals, I ended up going with some bottles of the Pinot Gris which is perfect for these warm summer days. There were 10 food trucks to choose from and each one was offering a $4 menu item. I was lucky enough to get a VIP ticket before they sold out and it included a voucher for one of those menu items. Feeding into my sugar addiction, I made a beeline for the liege waffle from The Plaid Pancake. 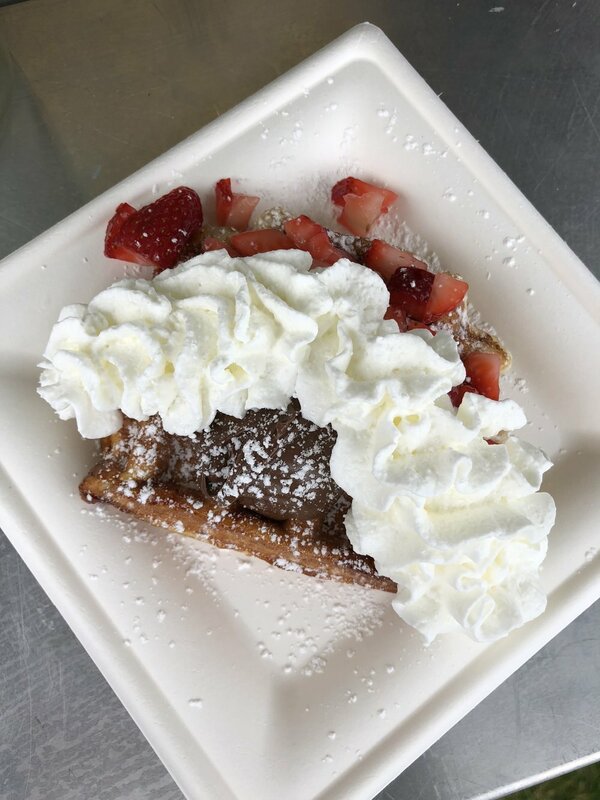 I chose to have it topped with Nutella, strawberries and whipped cream because why not? The Sparkling Rosé from Galway Rock Wines is always a favorite. I usually enjoy it out of the bottle (in a glass of course:) but they offer it on tap during the festival so it's a never ending supply of crisp, bubbly goodness that will keep you smiling all day long. I mean hey, sparkles happen! 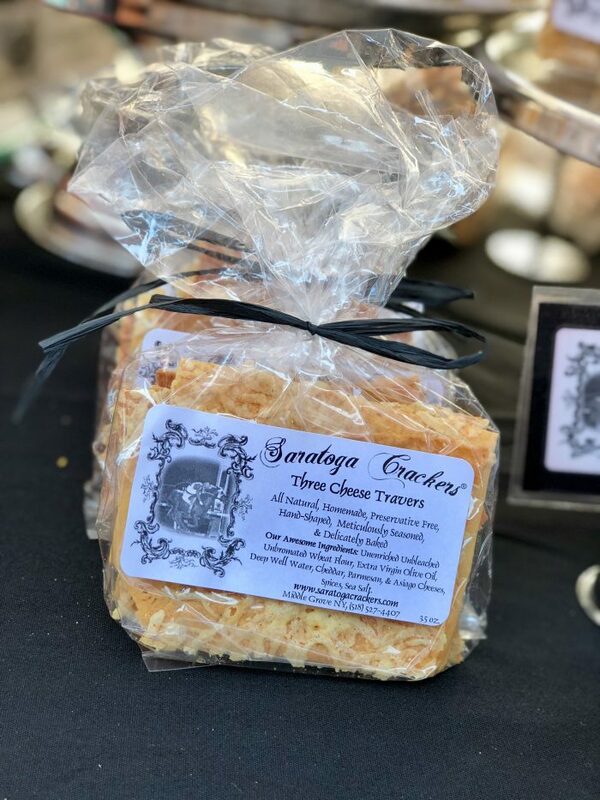 You can never go wrong with Saratoga Crackers because of the countless cheese options to choose from at the event. I always like to grab a few flavors before going on a hunt for ways to top them off. Another $4 food truck item being offered were the fish tacos from the Adirondack Pub & Brewery. They were light, crispy and topped with slaw and pico de gallo. Included was a Root Beer to wash it all down. Okay enough eating, back to the drinks. :) 1857 Spirits was sampling a few varieties of their potato vodka, all of which went down incredibly smooth. We also uncovered a new brewery and really enjoyed their Sunrise Session IPA. We discovered that flour could be made out of wine so you can literaly "eat wine" and that we did! Hello cupcakes! You can never go wrong with R&G Cheese Makers and their products go perfectly with the Saratoga Crackers. 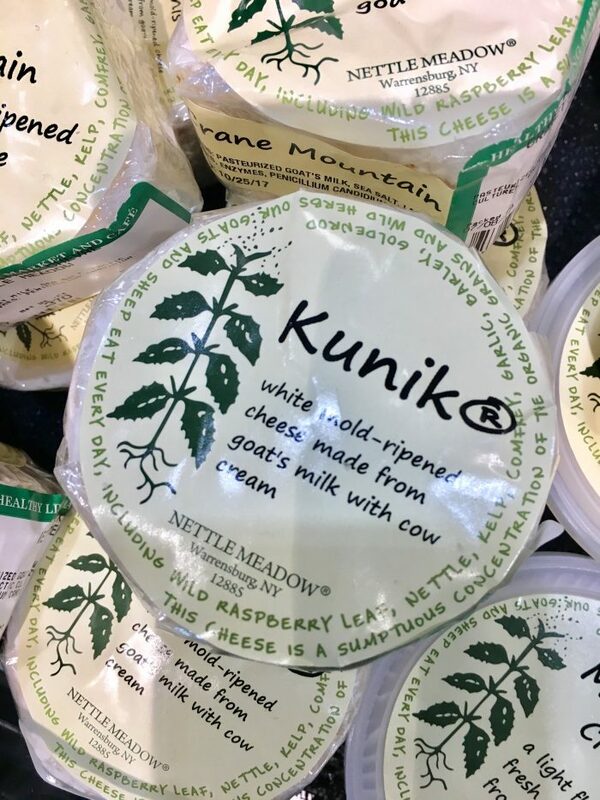 A flavor I found particularly interesting was the goat cheese with ramps. Very unique and absolutely delicious. A few other highlights from the day included the pulled pork grilled cheese from Gourmeli's Taste, Nine Pin Cider (everything:), wood fired pizza from Mach's and spirits from Lake George Distilling Co. and Tommy Rotter. There were plenty of other vendors to visit as well offering options for everyone. 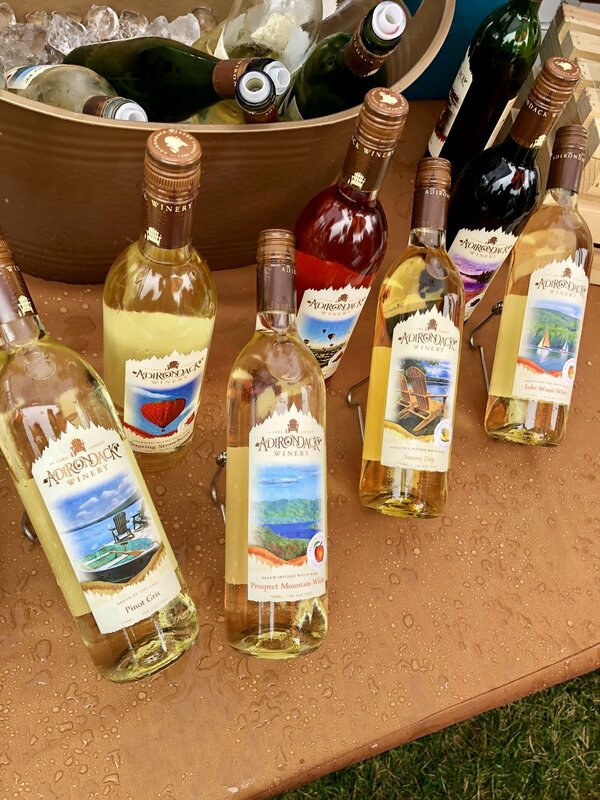 The Adirondack Wine and Food Festival is the perfect way to kick off summer in Lake George! Hope to see you there next year! I made this for guests recentely and it’s now my go-to side dish. Everyone loved it! 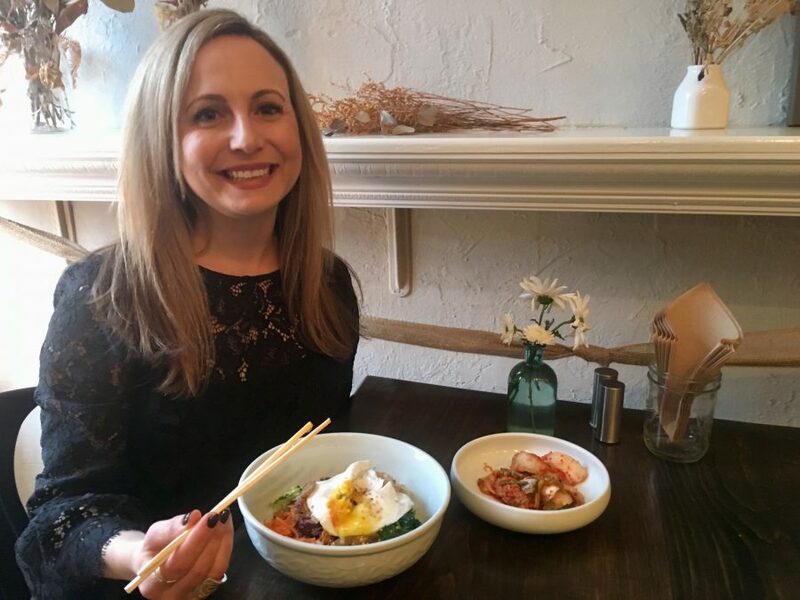 If you’re looking for fabulous Korean food, a welcoming environment and a great experience, Sunhee’s Farm & Kitchen in Troy is the place to go. I had the pleasure of sitting down with one of the owners recently to chat about how they got started and why they are passionate about the food they serve (video under the Bite Me Show tab coming soon courtesy of Filmworks 109). The dream began when two longtime friends combined their love of cooking, Korean heritage and names (a mashup of the owner’s names Sun Hwa and Chun Hee) to create Sunhee’s. Their love for food is evident in the farm fresh dishes they serve on a daily basis. They take special care when choosing where to source ingredients and like to utilize local farms like one out of Cambridge, NY specializing in Korean and domestic vegetables. The menu looked fantastic and I had a hard time deciding what to get but the Bibimbap is one of their signature dishes so I went with that. I added beef and a fresh sunny-side egg which I highly recommend. If you're unfamiliar with Bibimbap, it's a rice bowl served with fiddlehead, spinach, carrot, turnip, bean sprouts, shiitake mushroom, cooked egg strips, sesame oil and sesame seeds. Sunhee's offers the option to add beef, a sunny-side egg or tofu. The kimchi is made from a family recipe that’s been handed down for generations and it had the perfect balance of spiciness and crunch. It was so good I ended up buying a jar which is available at their restaurant as well as the Troy Farmers Market on Saturdays. The restaurant also has a small market where you can purchase other products like these incredible puffed cereal cookies (which are completely addicting). There were a lot of other interesting items as well so if you want to try something new or unique like shrimp chips, definitely check out what they have to offer. Sunhee’s is such a special spot located right in Troy. The traditional Korean fare, warm inviting atmosphere and incredibly nice owners will make you feel right at home. I had the pleasure of stopping in this week and was immediately greeted with the inviting smell of warm baked cookies in the oven. I told her that if Instagram could project scent, she’d be sold out by 9:00 AM. The case was filled with cupcakes, cookies, scones and one of their newer items, croissants. The Gobbler Croissant consisting of turkey, stuffing and cranberries sounded divine. I’ll take 2 of those and a few cupcakes to go please! Not only did she have her everyday items on display, but Valentine’s Day goodies as well. 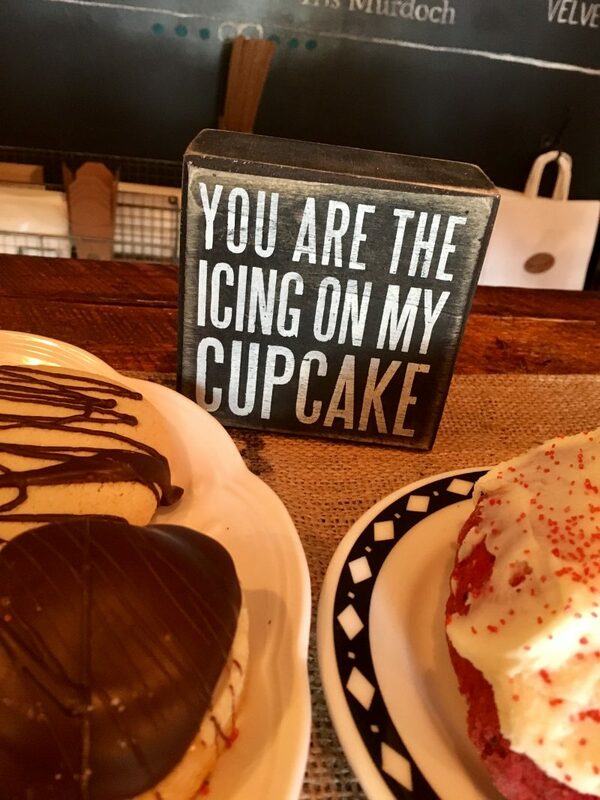 If you’re looking to treat yourself, a loved one or friends, make sure you stop in and grab something at Bake for You. The enormous heart shaped shortbread cookies covered in either red sugar or chocolate were a huge hit as was the red velvet scone smothered in cream cheese frosting. You can also get heart shaped brownies and smaller heart shaped cookies filled with caramel and topped with chocolate. All of these made my heart and taste buds sing! Bake For You will sweeten up any day and Valentine’s Day is no exception. I ♥ this place and you will too! Looking for a great holiday cocktail to make on Thanksgiving? 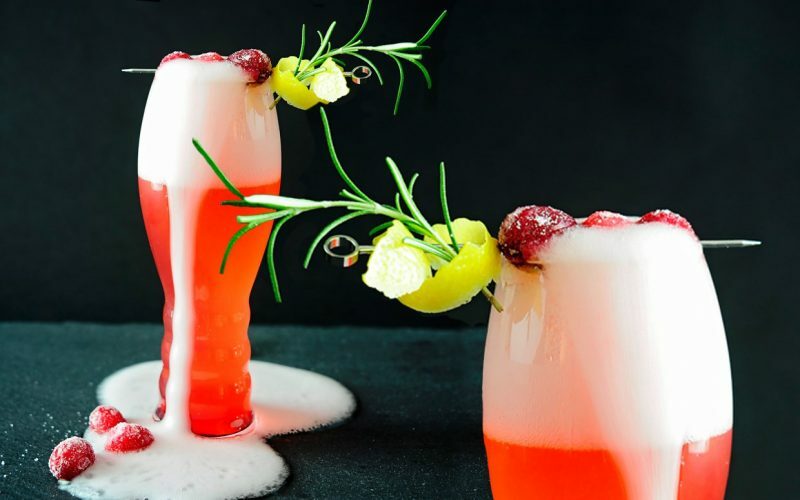 Check out this Cranberry French 75. I may need to do a trial run before the big day :). Looks festive and delicious! 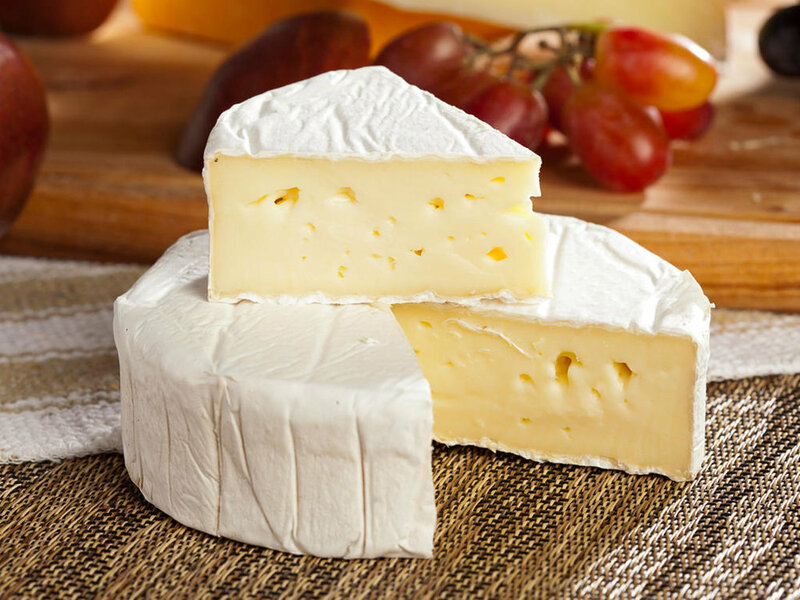 Check out this fun cheese making class coming up on November 5th at Healthy Living Market in Saratoga. It's delicious on tacos, burgers, hot dogs or right out of the jar. Totally addicting! The Liege waffle is one of my absolute favorite things to get at the Troy Farmers Market. It’s served warm and has the perfect amount of extra crunch on the outside from the caramelized pearl sugar. LOVE LOVE LOVE! It’s so refreshing on a warm summer's day. 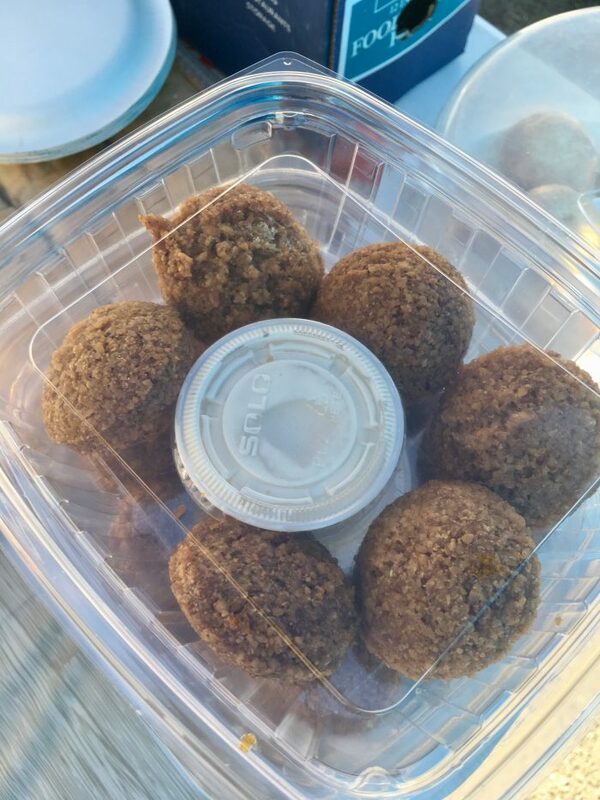 During the fall, they offer Pumpkin Spice and Apple Cider smoothies which go perfectly with a fresh cider donut. They have a large selection of flavors to choose from so you are bound to find a bunch that you’ll fall in love with. Bring on the Dashing Through the Dough (cookie dough peanut butter) please! The Life of Pie and I Want S'more will have you looking for a spoon or a piece of bread ASAP. Light, crisp and refreshing with just the right amount of effervescence. This will add some sparkle to your Saturday night or pizzazz to a Wednesday. Figs and Goat Cheese are a match made in heaven. The other varieties they offer like Orange Ginger or Garlic and Herb are wonderful as well. I love all of the cider from Nine Pin but my favorite is the Ginger. It’s great for fall too! A perfect combination of spices and beef, this will have you thinking palm trees and sandy beaches. There are plenty of options to choose from but this stands out as one of my top picks. The cinnamon sugar is a home run too! 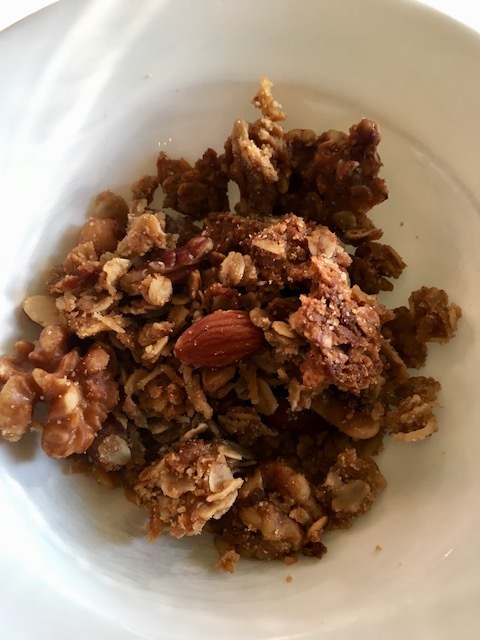 Enjoy their granola plain, on top of yogurt or ice cream or as a streusel topping. 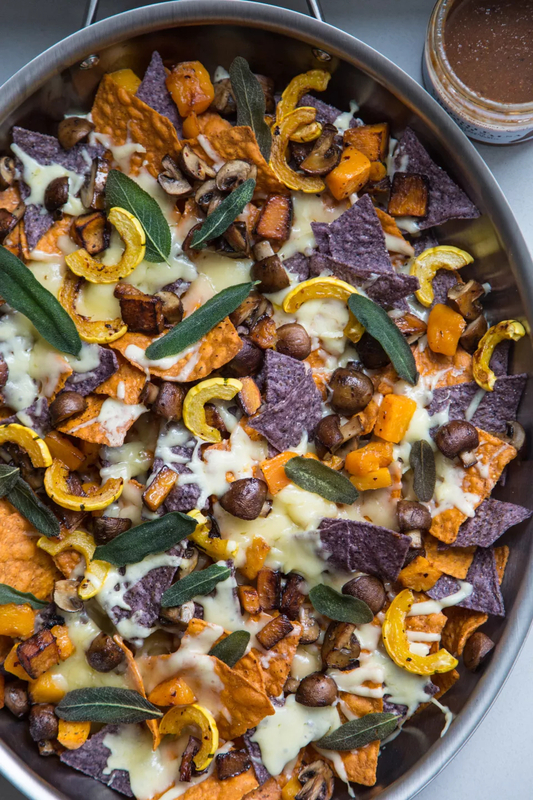 The Pumpkin Pandemonium is perfect for these cool fall days and upcoming holiday season. Wonderful on its own or with crackers or bread. Pair it with a glass of wine and you’ve got a winning combination! A few other notable mentions are Yummy Kitchen (Troy), Crepe Me Up and Oh Corn! Arepas and More. This is by no means an exclusive list and there are a TON of other local purveyors with wonderful products. I just wanted to call out a few that I really love. 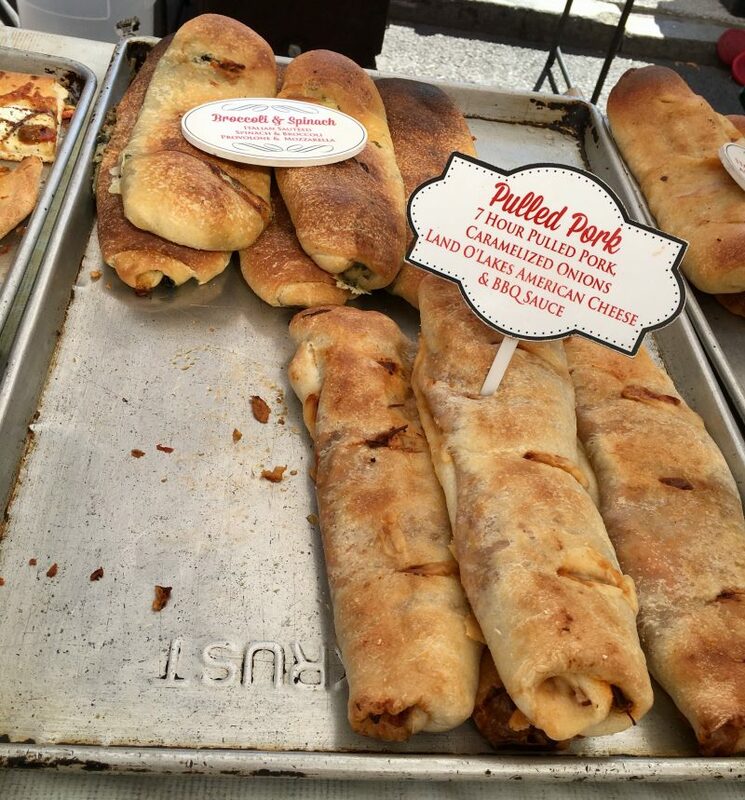 What are some of your favorite farmers market finds? Summertime means trips to the beach, and what better place to be during the dog days of summer than Cape Cod. The only other thing I plan more diligently then my beach days, are my dining days. We arrived in the charming town of Chatham, MA and after a morning stroll on the beach, we headed down to Main St for one of my all-time favorite treats, a Ritzie from the Chatham Candy Manor. 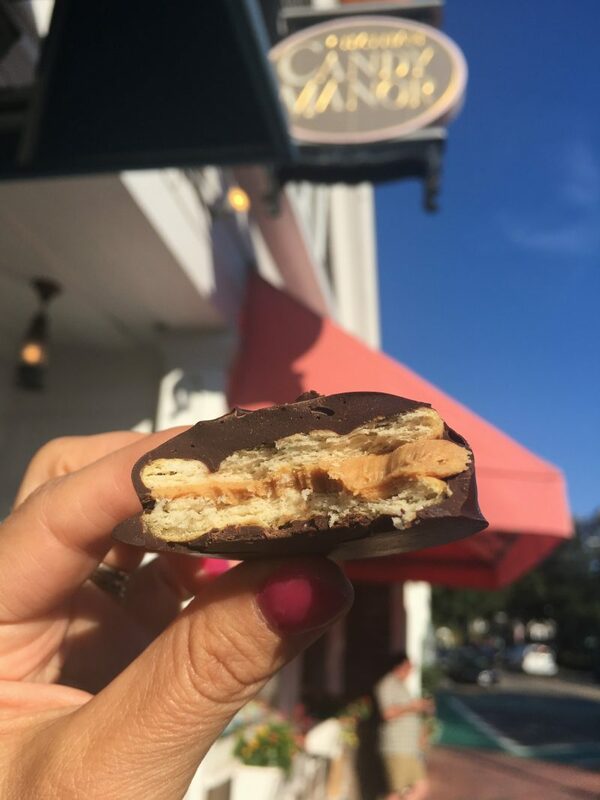 It is a perfectly salty sweet combination of peanut butter sandwiched between 2 buttery Ritz crackers covered in dark chocolate. So simple, yet so good. I noticed just above the Ritzies that there was something called Jordon Crackers. It piqued my interest so I asked what they were and uncovered another addiction. They were oyster crackers covered in either dark or milk chocolate and irresistible. After indulging on chocolate for breakfast, we headed over to Chatham Cookware for something a little more substantial. 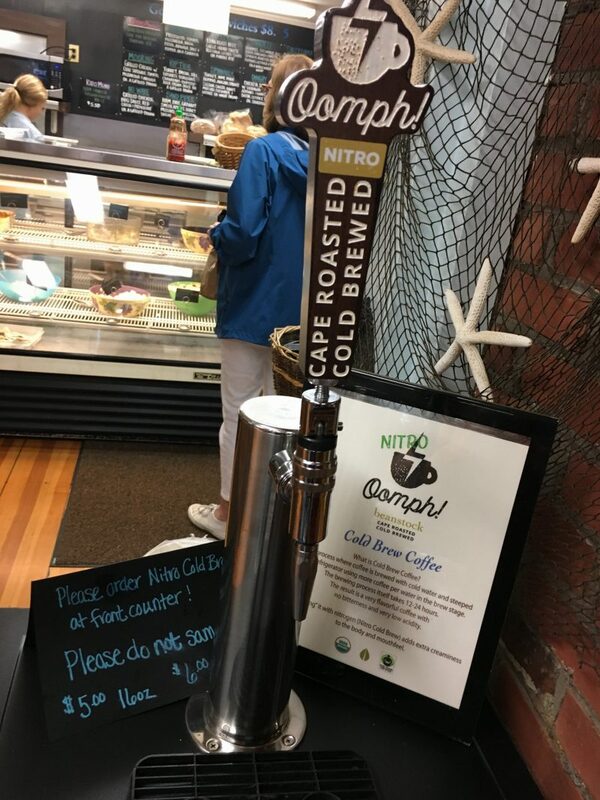 We started with the Nitro Cold Brew which was the perfect way to fuel up while enjoying their delectable breakfast sandwiches served on toasted Portuguese rolls (sorry no pics, we ate them too fast :). 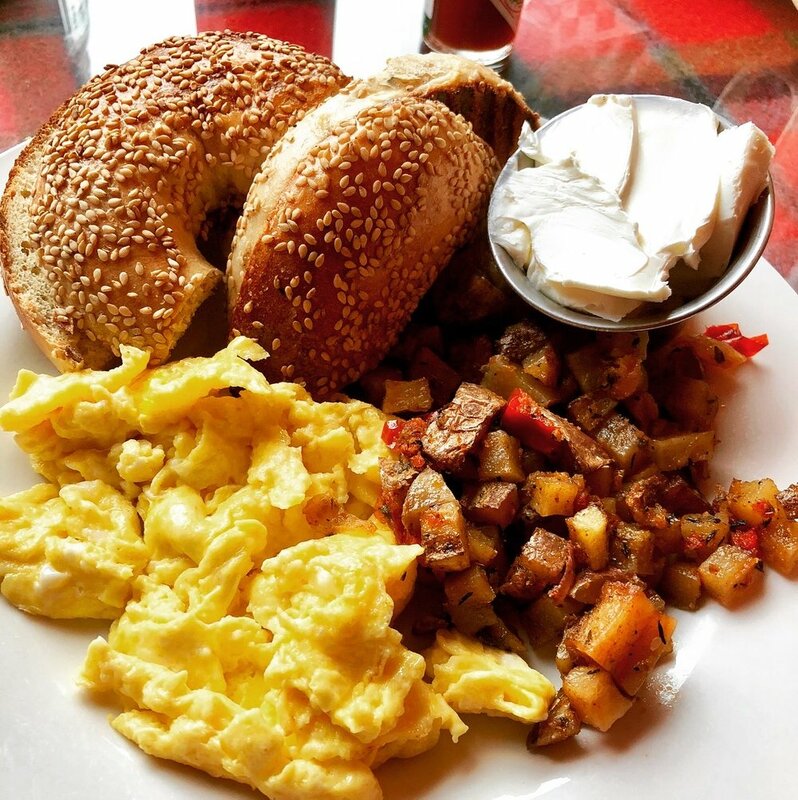 If you are looking for a quick breakfast or lunch, stop in and grab one of their many different sandwich or salad options. After a day on the beach and some down time, we headed out to dinner. 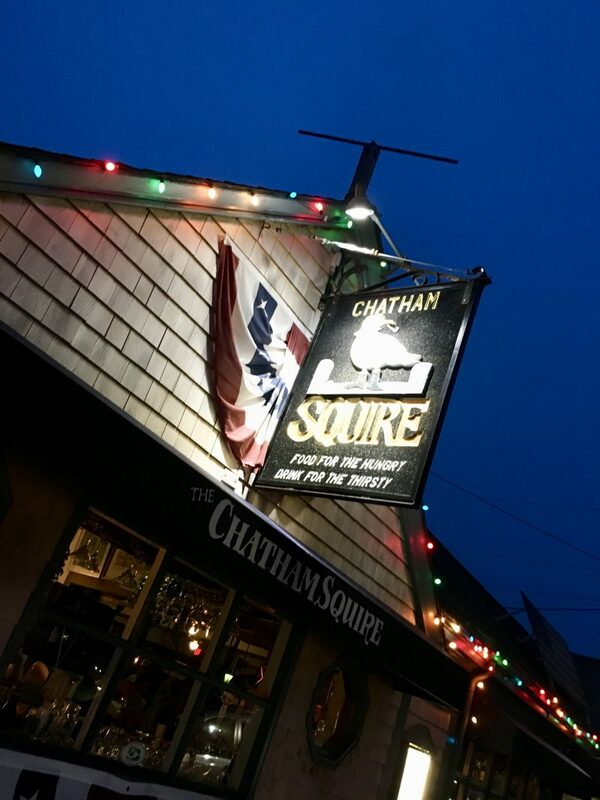 Chatham has a lot of dining options, but one of my favorites is the Wild Goose Tavern located right in the heart of the main strip. We started with the Tahini Hummus and Greek Salsa served with pita bread. For the main course, we ordered the Nicoise salad and the Fish and Chips. The salad consisted of Haricot verts, boiled egg, fingerling potatoes, olives and cherry tomatoes then topped with pepper seared ahi tuna. It was absolutely delicious and the combination of the egg with the potatoes, salty olives and crisp Haricot verts was perfect. The Fish and Chips were also wonderful and fried to perfection (although anything fried usually is). The Goose offers outdoor dining which is nice since a lot of restaurants on Main St don’t. The fun party atmosphere and entertaining bartenders inside make that a great option too. Try one of their house made infused vodkas or gin if you’re looking for a fun cocktail. Friday turned out to be a little more overcast which means it’s time to dine! You can’t beat the inimitable beauty of Chatham Bars Inn, and we have made it an annual tradition to have lunch at The Beach House. I swear I am going to try something new every year but the Swordfish Tacos get me every time. They are topped with queso fresco, shredded cabbage, cilantro lime crema and pickled red onion then served in a white corn tortilla. It’s the perfect seaside lunch with a breathtaking backdrop. Since the weather wasn’t the best for a beach day, we headed up to Rock Harbor to check out the iconic trees that are placed in the water which mark the channel boats can take. After seeing so many pictures of it on Instagram, it was really fun to actually see it in person. As we headed north, the sun started to shine and it put me in the mood for a sweet treat. PB Boulangerie located in Wellfleet has some of the best croissants, freshly baked bread and desserts on the Cape. This French bistro is a must no matter where you are staying. Although the Chocolate Tarte and Coffee Eclair looked superb, I thought I’d keep it light and get the Pavlova. The fresh tart raspberries on top balanced out the sweet crunchy meringue making it the perfect afternoon pick me up. I can’t recommend their croissants, bread or desserts highly enough. They also serve dinner and offer a prix fixe menu option as well. Bon Appétit! After some Wellfleet adventures checking out the Bookstore and Mac’s Seafood, it was time to hit up another Cape Cod staple, “the Comah.” The Beachcomber consistently gets rated as one of the top 10 beach bars in the country and if you’ve been, you know why. The views overlooking the endless beach and blue sky are spectacular. The vibe at the Comah is fun, relaxed and beachy (not to mention crowded ALL THE TIME.) We usually try and grab a seat at the bar (after I hover over people paying their bill;) since the wait to sit at a table is typically pretty long. They have a raw bar where you can order oysters, clams, ahi tuna and a plethora of other freshly caught seafood. After enjoying some freshly shucked Wellfleet oysters, we apparently couldn’t get enough and ordered the fried oysters and tuna tacos. The reggae, fresh seafood and beach vibe will keep you in a summer state of mind making you never want to leave. It’s one of my favorite places to go, EVER! We started Friday out at The Chatham Cheese Company which offers a wonderful selection of artisanal cheeses, charcuterie, wine and crackers along with bread and other small snacks. This is a great shop to check out if you are looking to bring something to the beach or want some delicious options for a cheese board. The staff is more than helpful and if you are looking for recommendations, they know which direction to point you in. If you go, I highly recommend the Manchego. A new and extremely cool experience we discovered this year was the Chatham Shellfish Company. It’s a little place near Harding’s Beach where they raise oysters that you can buy right out of the ocean for one of freshest oyster experiences you'll ever have. It was so interesting to see how they cultivated them and to check out the operation. It was a really fun thing to do and if you're an oyster fan, it’s worth the experience if you think you won’t lose a finger trying to pry them open yourself :). Apparently dessert is always on my mind so we headed to another Cape Cod staple, Sundae School. This was actually our maiden voyage (ummm hello how could this be?) and all the hype is true. The chocolate chip cookie dough ice cream taught me why this will be another annual tradition. The rich creamy ice cream, gobs of cookie dough and bittersweet chocolate chips were a match made in heaven and Sundae School gets an A++ on this one. Another fun adventure to check out if you’re in Cape Cod is Truro Vineyards. They offer both wine and spirit tastings in a beautiful setting just south of Provincetown. It’s a relaxed scene with plenty of tables to hang out at and enjoy some wine or food from one of the food trucks. If you go and want to grab wine before or after a tasting, I recommend the Rosé and Cabernet Franc. Wine tastings are done every half hour overlooking their beautiful vineyards. As we journeyed back to Chatham, we stopped at another yearly favorite, The Wequassett Resort. This spectacular hotel has impeccable views and amenities with a giant gas fire pit and pool overlooking Pleasant Bay. In keeping with the Cape Cod theme, I started out with the Devils Purse Kolch which was crisp and refreshing. It went perfectly with the soy and green chili tuna poke. If you want fabulous food in an incredible setting, this is a must. Another tavern to check out in Chatham (they also have a location in Dennis Port) is the Red Nun. It has a relaxed vibe, good crowd and delicious food. After some fun at the Nun we headed to The Squire where it’s always a party and a great way to wrap up a late night. While we were out and about over the weekend, three separate people mentioned Bluefins Sushi and Sake Bar. We have walked past this place many times but it was never on our radar to stop in. After all the notable mentions, we thought we’d bid farewell to the Cape and have lunch there before leaving to go home. We started with the Asparagus Fries which were tempura battered and came with a truffle aioli dipping sauce. My only complaint is that I had to share. We also had the Lettuce Cups which were filled with grilled pork belly, pickled cucumber, carrot and daikon slaw and miso mustard aioli served on top of bibb lettuce. Along with that we had a couple of sushi rolls which were unique and delicious. If you are in the area, definitely put this one on your list. A few other notable mentions- Although we didn’t have dinner at Bistro on Main, the menu and atmosphere looked great. The Chatham Wine Bar is also excellent and we really enjoyed the food there last year (shown below is the tuna tartare with miso sorbet). Plus they have a pretty outdoor dining area with fire pits. If you’re in Provincetown, check out The Canteen and definitely get the Crispy Brussel Sprouts in fish sauce. Make sure you walk around back and check out the outdoor dining area and views of the ocean. If you need something sweet, head over to Scott Cakes where you have to “open your mind because there’s only one kind.” They only offer one type of cupcake but the soft velvety vanilla cake topped with their signature pink frosting is really all you need. Wishing you delicious travels in Cape Cod and beyond! The Adirondack Winery has opened a beautiful new tasting room in Bolton Landing, NY. Upon walking in, you are greeted with Adirondack inspired artwork, wine barrels and the friendliest staff. There’s a large area to do tastings on one side and then an entire wall dedicated to wine on the other. It’s a great way to browse through all of their products after sampling so you can grab some of your favorites. We ended up doing our tasting with Bunnii who was very friendly and knowledgeable and just a lot of fun to chat with. She asked what type of wine we liked and then made some recommendations based on that. To accompany this, I ordered the Locavore slate plate which featured all local products like cheese from the Adirondack Cheese Company, Saratoga Crackers, Birnn truffles (out of VT), tapenade made with their Red Ruby wine from a local chef and a delightful strawberry jelly also infused with their wine. I highly recommend getting this along with the upgraded tasting glass that they offer. Both really enhanced the whole experience plus the glass is yours to keep! After trying a lot of different varietals, we wrapped up our tasting with 2 wine slushies. The first was a ginger hibiscus and the other was a delectable frozen coffee creation made with Kru coffee out of Saratoga, Cabernet Sauvignon and chocolate syrup. In addition to offering a great tasting experience, the winery also sells products from a lot of local businesses, wine gift baskets, and all of the products featured on the slate plate. There are a lot of really nice gift options if you need something for a friend, relative or just yourself. We had so much fun talking with Bunnii, Ava and everyone else while doing our tasting and I highly recommend checking out their beautiful new tasting room in Bolton Landing. Cheers! 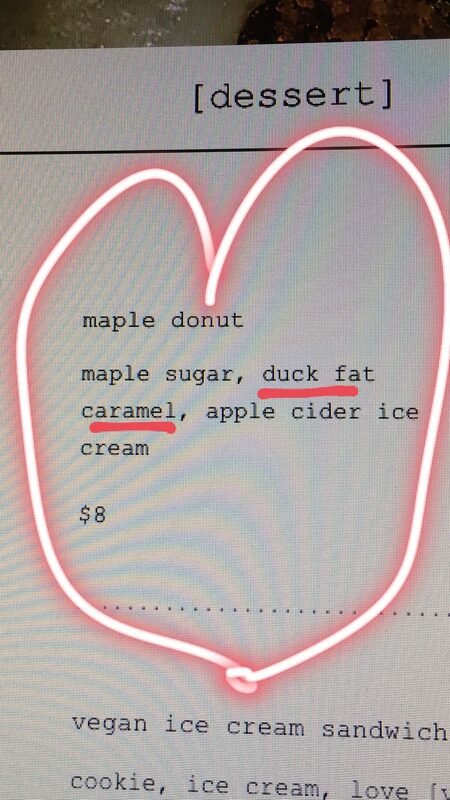 The Shop in Troy has such a great menu. It was a delicious weekend where I kicked things off at Oaxaquena in Albany with some of the most amazing and authentic Mexican food I’ve had in a while. The chips and guacamole were wonderful, and all 3 tacos we tried were fabulous. I had a Cricket taco for the first time, and really enjoyed it along with tacos al Pastor and Tinga tacos. We had dinner at Blue Water Manor in Lake George on Saturday, and the pulled pork paired nicely with the mountains as a backdrop. I wish I could eat here every night with views like this! You can't have dinner without dessert and what better place to grab an ice creme than at Martha's Dandee Creme in Queensbury. I think the entire Capital District and beyond may have been there, but it's worth the wait. Enjoyed a cool glass of Sauvignon Blanc at The Sagamore on Sunday before heading to Bolton for a wine tasting. The Adirondack Winery has a new tasting room in Bolton Landing (blog post to follow later this week) so we stopped in to sample some wine which was delightful and went really well with the Locavore cheese plate. It was such a great time and we really enjoyed talking with the knowledgeable staff about their products along with the other local items they sell. If you are in the area, make it a point to stop in and say hi. They also have another tasting room in Lake George Village as well. And here is the recipe for Grapesicles but you could use any fruit like strawberries, blueberries etc.